The North Carolina Tar Heels earned the No. 1 seed in the Midwest Regional this season with a 27-6 record and two wins over top overall seed Duke. They beat No. 16 seed Iona easily in their first-round matchup. Now, they'll face a much stiffer challenge against a No. 9 seed Washington Huskies squad that beat No. 8 seed Utah State convincingly on Friday. The Tar Heels are 12-point favorites for the 2:40 p.m. ET tipoff with the total at 150.5 in the latest North Carolina vs. Washington odds. It's an intriguing stylistic clash with UNC preferring to push the pace and Washington looking to slow it down. 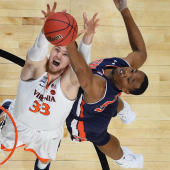 Something will inevitably have to give, so before you make your UNC vs. Washington picks, be sure to check out the 2019 NCAA Tournament predictions from the proven computer model at SportsLine. This model, which simulates every game 10,000 times, has raked in the winnings for those following its picks. Over the past two years, the SportsLine Projection Model has returned over $4,000 to $100 players on its top-rated college basketball picks. It also entered the postseason on a strong 11-5 run on all top-rated college basketball plays. Anyone who has followed it is way up. Now, the model has zeroed in on North Carolina vs. Washington. We can tell you it is leaning under, but it also has a strong against the spread pick that hits in over 60 percent of simulations. You can only see that one at SportsLine. Entering Sunday's second-round battle, the model knows that one big advantage for North Carolina will be pace. The Tar Heels like to use their athletes to get out on the move, which is why they ranked fifth in the nation in adjusted tempo, according to KenPom. Coby White is one of the fastest players in the country, and he's used that speed to average 16.1 points and 4.2 assists as a true freshman. Washington's defense will have its hands full trying to keep White in front of them. The Huskies prefer to play a more methodical game, ranking 259th in adjusted tempo. So if White and the Tar Heels can dictate the pace, they'll have a strong chance to pull away as Washington runs out of gas late. However, the Huskies have shown a knack for disrupting defensively, which is a big reason why they could cover the North Carolina vs. Washington spread and advance in the 2019 NCAA bracket. In an era where offense seems to dominate the discussion in college basketball, Washington guard Matisse Thybulle has been in a class to himself defensively. He's won Pac-12 Defensive Player of the Year in back-to-back seasons and he proven to be a one-man wrecking crew at that end of the floor during the 2018-19 season. Thybulle averaged 3.5 steals and 2.2 blocks per game as a 6-foot-5 wing, and he's the driving force behind Washington ranking No. 4 in the nation in opponents' turnover percentage (20.7). Against a North Carolina squad that ranked 185th in the nation in turnovers per game (13.1), Washington has a chance to steal possessions on Sunday thanks in large part to Thybulle's disruptiveness. Who wins Washington vs. North Carolina? And which side of the spread hits in over 60 percent of simulations? Visit SportsLine now to find out which side of the Washington vs. UNC spread you need to jump on, all from the model that has crushed college hoops, and find out.